Report of Foreign Bank and Financial Accounts (“FBAR”) requirements seek to solve a pressing information asymmetry problem relating to U.S. persons’ investment in non-U.S. financial accounts. FBAR reporting requires U.S. taxpayers themselves to disclose offshore account information to the U.S. government. 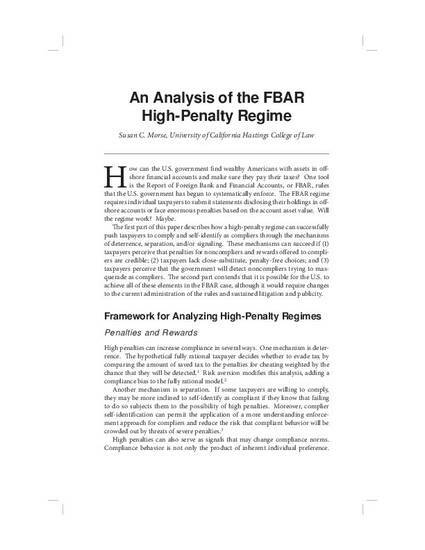 Noncompliance with FBAR requirements carries high potential penalties. These high penalties could serve some or all of the goals of deterrence, separation or signaling. To maximize the chance that a high-penalty regime will succeed at one or more of these goals, taxpayers should perceive that they actually face painful penalties for noncompliance and/or worthwhile rewards for compliance. They should also lack close-substitute choices not subject to penalties. Finally, they should believe that the government has an effective mechanism for detecting noncompliers who attempt to masquerade as compliers. The FBAR reporting regime could include all of these features. Publicity and audit efforts have enhanced and can continue to enhance taxpayers’ perception of the likelihood of penalty imposition and noncompliance detection, and it is possible to remove the problematic close substitute of quiet disclosure.